The site of a Medieval or Post Medieval bank and three fishponds, used for the breeding and storage of fish. They are marked on the Ordnance Survey map of 1926. They are situated 100m west of Blaeberry Street, Brownsover. 3 An archaeological evaluation including documentary research and ground investigation was undertaken prior to housing development. The fishponds probably belonged to the manor of Brownsover. They may have been Medieval or Post Medieval in origin. The earliest definite reference to them dates to 1705/6. The ponds were buried in up to 2.5m of modern debris by the 1960s. The fishponds consisted of a series of three subrectangulaar ponds created by damming an earlier, existing stream. 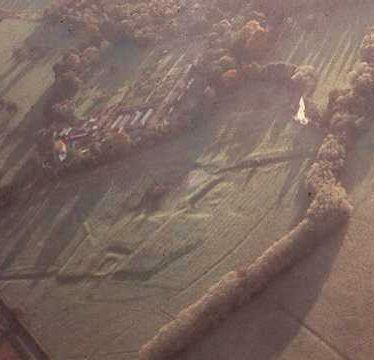 The relationship of the ponds to the ridge and furrow on either side may suggest a Post Medieval (or late Medieval) date. The site of a quarry that was in use during the Imperial period. It is marked on a tithe map of 1840. The quarry was situated in the area of Bilton Road, Bilton. The site of Rugby Old Station, a railway station that was in use during the Imperial period. It is marked on the Ordnance Survey map of 1886. The railway station was situated 100m north of Worcester Street, Rugby. A railway bridge that was built during the Imperial period. It is marked on the Ordnance Survey map of 1886. The bridge is situated on Parkfield Road, Rugby. The site of a railway viaduct over the Oxford Canal. It was built during the Imperial period and it is marked on the Ordnance Survey map of 1923. The viaduct was situated 1km west of Clifton upon Dunsmore. A fishpond used for the breeding and storage of fish, dating to the Medieval period. It is visible as an earthwork. It lies 200m north east of Merevale Abbey. The site of fishponds associated with Merevale Abbey. They are Medieval in origin and survive as earthworks. They are situated north of the site of Merevale Abbey. Fishponds used for the breeding and storing of fish, which date to the Medieval/Post Medieval period. There is 18th century documentary evidence for their existence, and they survive as overgrown earthworks. They are situated at Boat House Spinney, Dunchurch. A Medieval/Post Medieval fishpond used for the breeding and storage of fish, for which there is documentary evidence. It survives as an earthwork, and part excavation has uncovered pits and building debris. It is situated at the north east end of Coombe Abbey Park.